Browse listings for Cable Beach rentals below. Cable Beach is a popular destination for renters due to its close proximity to Lynden Pindling International Airport and Nassau's town center. The area is also known for its fantastic restaurant options, and great selection of entertainment. Homes for rent in Cable Beach come in a variety of property types and styles, including convenient condos, charming pastel-colored houses, and upscale residences. No matter where you rent in Cable Beach, you'll be within walking distance of the beautiful beaches and amenities of the community, making it the ideal location for many renters. Search all Cable Beach rental listings below, or keep reading about Cable Beach homes for rent and discover everything this popular community has to offer. Cable Beach homes for rent include condos, spacious single-family homes, and townhomes. Luxury condos for rent offer spectacular views, as well as amenities such as a swimming pool, a fitness center, a media room, and a conference room. Single-family homes offer renters a more exclusive sense of privacy and space, and townhomes are a great option for renters looking for something more affordable. Waterfront Cable Beach rentals are available in both detached homes and condos, and many properties for rent in the area are within walking distance of restaurants, shopping, and entertainment venues. 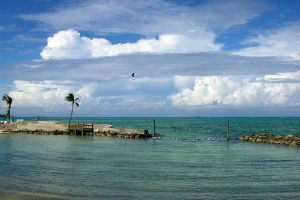 Cable Beach is well recognized in the Bahamas for its expansive hotels and array of dining options. Homeowners and renters alike enjoy the numerous local and chain restaurants in the area, and the Crystal Palace Casino is a popular spot for an evening out. Public beaches provide residents and tourists with a place to soak up the sun and swim in the sparkling Bahamian waters, and for golf enthusiasts, the Cable Beach Golf Club has 18-holes of play. Interested in viewing Cable Beach homes for rent? Our agents are experts on the Bahamas rentals market and will be happy to answer your questions and set up a walk-through of your favourite Cable Beach properties. Contact us online or call 242-393-1811 today!